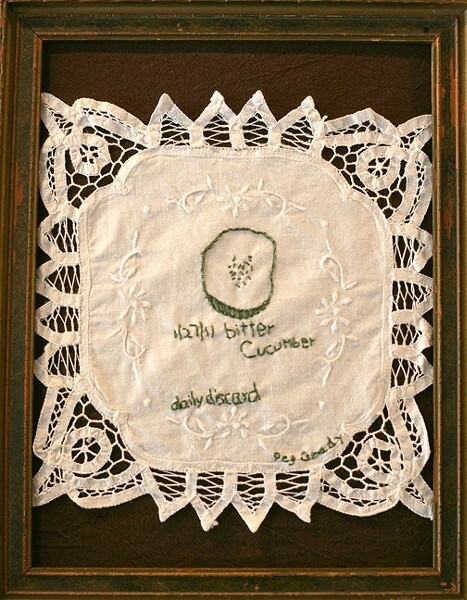 QUIRKY KITTEN : Santa Margarita artist Peg Grady is displaying a series of recycled linens with stitched depictions of items she’s discarded, at Deer Run Art & Artifacts through Sept. 5. 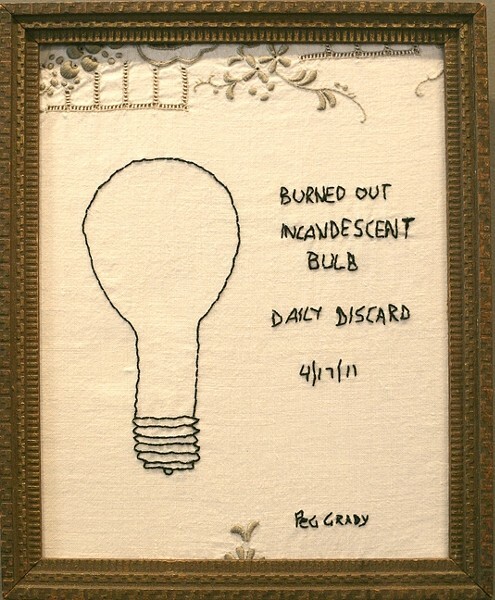 Peg Grady’s odd series—“Daily Discards”—fits right into the eclectic mélange of Deer Run Art & Artifacts, a Cambria gallery whose motto is “Objects of Interest from the 20th and 21st Centuries.” The little shop is teeming with curios, antiques, vintage items, jewelry, and unusual art. For instance, a four-foot-tall ceramic statue of Chairman Mao greets visitors as they enter. It’s Sunday, July 31, at 4:30 p.m. when I arrive at Deer Run, and gathered on the front porch are a half dozen youthful hipsters, including Neal Breton of San Luis Art Supply and Deer Run’s curator Nick Wilkinson. I’m in the right place! “Wow, Peg, you’ve really attracted the youthful edgy crowd!” I say. As you enter, Peg’s work occupies the left wall. These are remarkable little creations—at once simple and yet profound, small testaments to items whose once useful lives have run their course. 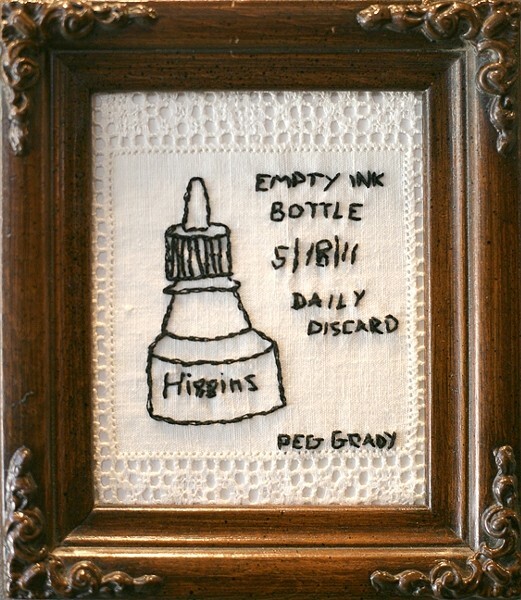 Peg’s taken discarded linens, doilies, some with embroidery already sewn into them, and she’s stitched contour drawings of things she’s thrown away. 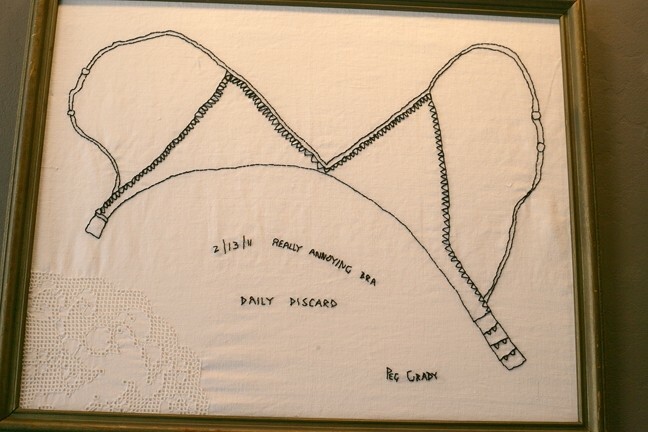 They’re like mini monuments comprised of thread and thought to items now obsolete, all presented in recycled frames. It’s a rather ingenious and somewhat ironic concept, to take discarded linens and frames and recycle them into tributes to other discarded items that weren’t recycled. Think of them as meta folk art presented by a conceptual artist! How does one celebrate the lowly incandescent light bulb? It’s currently the center of a raging debate between tree huggers who would like to see the now 100-year-old invention tossed to the scrapheap of history and the opposition who believes they have a god-given right to the inefficient icon of a bright idea. They can’t cotton to the swirling new fluorescent’s delayed illumination and absurdly whimsical design! And what of the case of the Really Annoying Bra? Or the Bitter Cucumber? Or the Key to Truck Sold Months Ago? “Is it embroidery?” I ask. Even so, they’re delightful little things. Peg’s simple drawing style whimsifies these quirky objects. 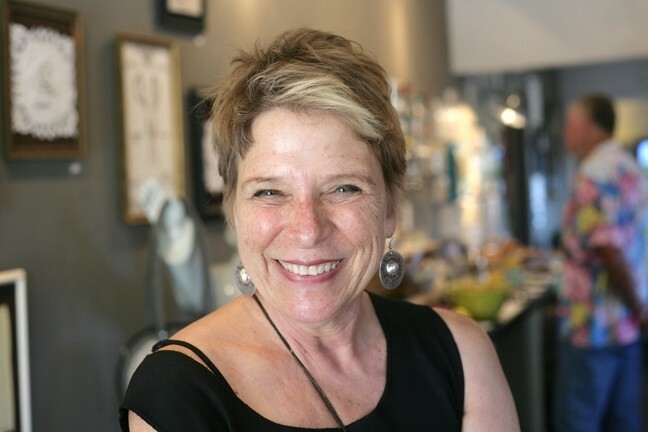 Even her original contour drawings are for sale, cheaply priced at $50 in a basket filled with small, framed ink drawings. The actual linens aren’t much more, going for between $150 and $275. 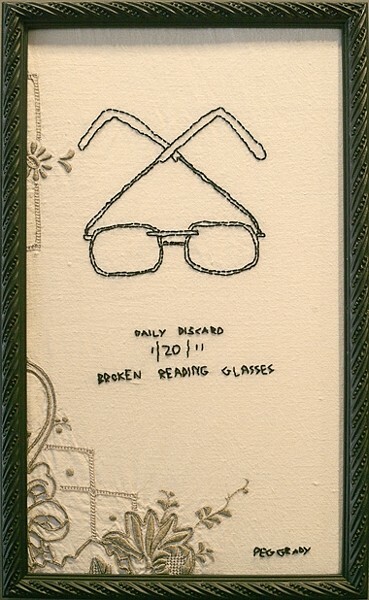 I salute you, Broken Reading Glasses! I sing your praises, Empty Nail Polish Bottle! May you live long upon a parlor wall!